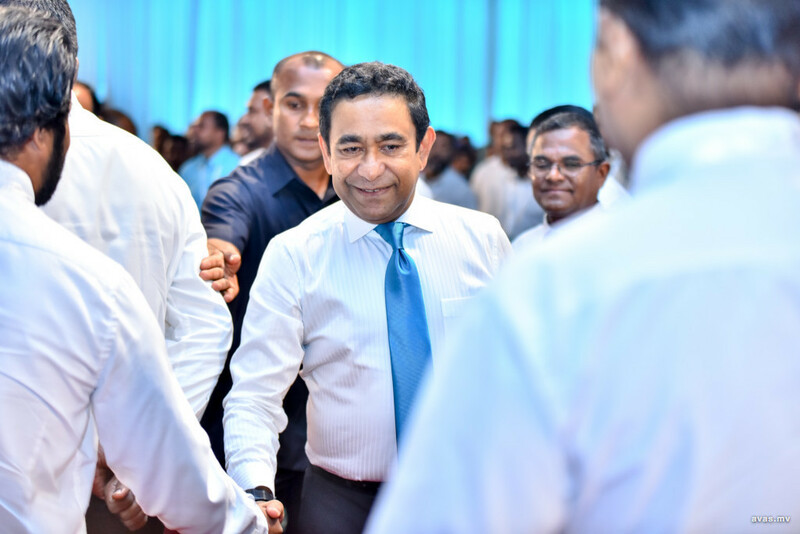 Male, February 1 (Avas): Former Maldivian President Abdulla Yameen’s new party, the Peoples National Congress (PNC) has been officially registered by the Elections Commission (EC). The party was registered on Thursday, while the official registration documents were handed over to the party at a special ceremony held on Thursday night. The party was registered amid allegations that the Elections Commission (EC) was deliberately delaying registration of the party. Prior to its registration, a large number of membership forms submitted by the party to the EC to fulfill the requirement of 3000 forms, were disqualified by the electoral watchdog for various reasons. The issue was taken up with the Speaker of the parliament, Gasim Ibrahim by PNC members. However, the Elections Commission had abruptly announced that the requirement had been fulfilled and gave the green-light to hold the party’s inaugural congress. In a new development, the same night the party received authorization, the Elections Commission brought amendments to their existing regulations which would allow the commission to dismiss a previously issued authorization to register a political party. The new regulations state that if the commission identifies that the resources of an existing party is being used to form a new political party, the commission reserves the right to revoke the permit issued to form the new political party. According to the amendment, in the case that the formation of a new party leads to the leadership positions of an existing party to be vacated, and there are no officials to run the existing party, the commission has the authority to reject the registration of the new party. In addition to this, the party registration permit may also be revoked in the instance that undue influence and authority is used to create a new party. Former president, Yameen had moved to register a new political party as the dispute over the opposition Progressive Party of Maldives (PPM) leadership dragged on. The Civil Court in 2016 found former president Maumoon Abdul Gayoom guilty of violating the constitution, party charter and the political party law and handed-over party control to half brother and the then president Yameen. Gayoom however was unceremoniously ousted from the party after falling-out with his half brother Yameen. A lawsuit was then filed challenging the legality of the PPM leadership and asking the Civil Court to handover party reins to the elder Gayoom. “We can’t head to an election with the party’s future shrouded in uncertainty. Supreme Court is in recess. We don’t when or how the verdict would come. So we can’t take any chances,” Yameen explained the reasons behind the bid to form a new party. The former president also urged his supporters to immediately switch to the party if and when the time comes, and several members of PPM and its council moved to PNC. A member of the general public filed a complaint at the commission following the new amendments over the use of Progressive Party of Maldives (PPM)’s assets by the party. However, the committee established by the Elections Commission (EC) to probe the complaint revealed on Wednesday that the commission cannot look into the complaint under the new regulations. EC confirmed that commission decided to take no action against PNC as the new regulations that prohibit the use of other party’s assets and resources for the administration of a second political party was introduced after the permit to register PNC was already issued. The temporary leadership of the party was elected on Sunday night at the party’s inaugural congress held at Dharubaaruge. Former President Abdulla Yameen participated in the inaugural congress required for the official registration of the party. The electoral vote for the party’s leadership was taken at the congress, which saw Abdul Raheem being appointed as the temporary party leader. Two candidates were nominated for the post of Vice President; former Economic Minister Mohamed Saeed and former Defense Minister, Adam Shareef. All three nominations were approved on the consensus of all 357 representatives who participated in the congress.